“Stand up and be counted”. That is the rallying cry from Tommy Wright as Corby Town bid to turn their fortunes around with the aid of an FA Cup replay tonight (Tuesday). The Steelmen head to Evo-Stik Northern League Premier Division side Rushall Olympic looking to earn themselves a trip to Stourbridge in the third qualifying round a week on Saturday. 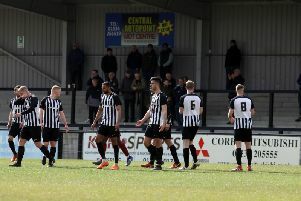 Corby needed an own-goal from Gavin Caines to give them a second chance after Rushall had taken a second-half lead in the 1-1 draw at Steel Park on Saturday. That result left Wright’s men without a win in eight matches in all competitions - a run of form that the manager simply described as “poor”. And he insists nights like tonight are when his key members of the squad must turn up. “It is a match for big-game players and, as I look around my squad, I do believe I have some of those,” Wright said. “They need a performance and they need to do their bit in helping the club progress in the competition. “We are without a win in eight and it’ is poor. It’s not what I expect from the group. “They need to stand up and be counted and go and get a result. Greg Mills is set to miss out again in tomorrow night’s replay due to an ankle injury while Anton Brown (dislocated wrist) remains a long-term absentee. Leicester City loanees Cedric Kipre and Aaron Hassell will also miss out again after an error in paperwork meant they were unavailable for the game at the weekend.